According to a study by the Mercatus Center at George Mason University, it takes 13 weeks to read Mississippi’s regulations in their entirety. Economists James Broughel and Jonathan Nelson used a platform called State RegData that was developed by Mercatus economist Patrick McLaughlin to read and count the words in Mississippi’s regulations. They’ve already examined the regulatory codes of 33 states so far. Mississippi has 9.3 million words and 117,558 restrictions worth of regulations. This puts the state mid-pack nationally in the number of regulation. New York, in comparison, would require a reader to spend 31 weeks to pore over the 22.5 million words in its regulations. The U.S. Code of Federal Regulations is even worse, with 112 million words that would take a person three years to read. The problem is that even with a regulatory code the size of Mississippi’s, the compliance costs are still substantial for businesses seeking to be in full compliance with the whims of the administrative state. One solution that could boost economic growth is for the Legislature to pass a law that would require all regulatory agencies to remove two rules on the books for every new rule they enact. Several attempts have been made in past sessions to pass this needed reform and all have failed. Another would be to limit the total number of regulations, which have the same effect. Many regulations that are enacted are never amended, which means they’re never given another look to see if their economic impact has changed or whether the activity they regulate has made them obsolete. Another would be for rules to sunset automatically unless the regulatory authority takes a look at them as they would with a new rule. 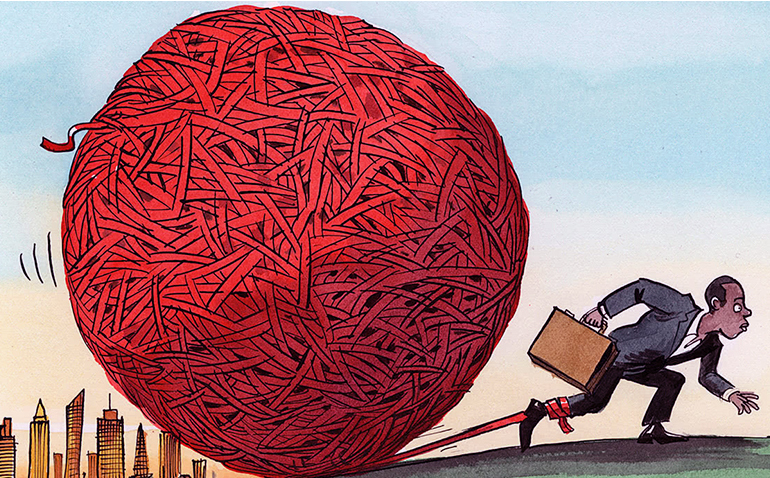 With our present rule-making apparatus, regulations become like ancient civilizations, building on top of one another, layer after layer, in a Gordian knot of red tape. Businesses are forced to rely on a specialized ecosystem of attorneys and accountants who can navigate the red tape and ensure their clients are complying. Cutting the amount of regulations at both the state and national level would empower businesses to spend money elsewhere rather than on compliance costs, making them more competitive in the global marketplace.